Billy voted against the agenda. Abstained on the budget adjustments. Then both he and Kirby gave the same tired old argument about how keeping the tax rate the same is the same as a tax hike. Then there was a magical interlude of professionalism wherein the Retired Military Tax Credit was combed through by county staff before it passed, and we moved on to the circus events. Billy had proposed legislation requiring that council members receive some minuscule amount of education regarding what the hell they are supposed to be doing there. Presumably this is because Billy is confuzzled. Possibly because he says he took a thing online with a quiz and it took five minutes, so what’s the big deal? How very educational. M.C. Keegan-Ayer proposed some amendments, which Tony Chmelik felt neutered the power of that legislation since it made it a mere suggestion. M.C. was basically like (to paraphrase this as we would have said it), look, don’t get all snippy with me, I was just trying to polish Billy’s turd here. Nobody was into making unnecessary laws, except Billy. Failed 1-6. Then there was the zoning violation drama, which is naturally a big ol thing to the nincompoop faction, in large part because of the great wedding venue drama of 2016. Billy and Kirby are both very upset that zoning complaints can be filed anonymously and for some weird reason they are allergic to anonymous criticism (neener-neener), and so Jerry Donald had to explain to them that some people may be afraid of their neighbors–and for good reason. (Tangential thought: can you imagine if Billy Shreve or Kirby Delauter were your neighbor? And you had some sort of property dispute? Scary.) At one point M.C. made it clear that she was not even able to try and fix this. Sigh. This failed too, because obviously. 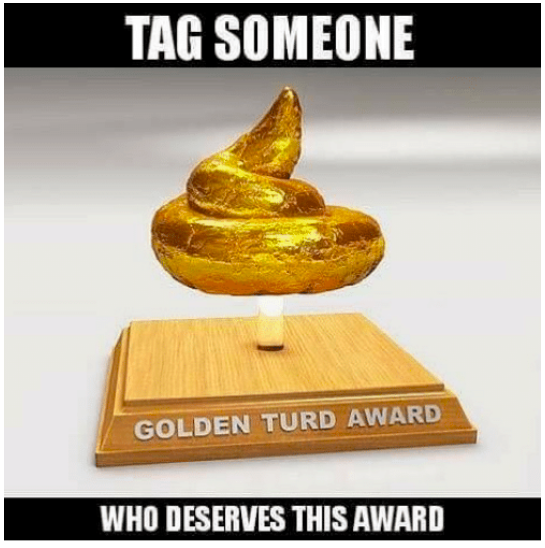 Turd status: unpolishable. Also there was the wood chipping scandal (it’s as if these bills Billy launch begin a listicle of Billy and Kirby’s prior buffoonery and proof that neither of them deserve to hold current office and certainly do not deserve to be entrusted with any additional responsibilities). Their position here, in a nutshell, is that these people have been in violation of the law for ages now, and how is it fair that someone noticed and is going to make them stop? Scandalous indeed! In fact, it becomes rather clear through Kirby’s bellyaching about County Executive Jan Gardner’s role in these zoning violations matters that he still does not understand the different branches of government under the charter. How is he going to be the county executive if he doesn’t know what that is? It will be a lot like the current status of Billy Shreve, who does not know what he is supposed to be doing ever. This bill failed because the one business it was initially custom tailored by Councildolt Shreve to benefit–until Tony Chmelik took over the turd polishing operation–was likely to be harmed by it, and hardly anyone thought that was a good idea. At one point during the discussion of this (or it could have been the earlier bill, but no matter) Billy was so stuck in oppositional defiant mode that he started opposing his own position. It was really a scene. Billy still remembers to like his own dumb ideas in the end, though. And after all that grandstanding and noise that Kirby made here, he voted against it! Off-track betting passed unanimously. It now has to go back for public hearing. Return of the haters: Your 8/22 meeting roundup! Looking right at ya Billy! If you were following our drinking game, we asked you to be on the look out for the boosters and haters. Both Billy and Kirby fell firmly into the haters category with Billy well in the lead. We started off very nicely. Bud recognized Catoctin High School for their character development award. He even calls Kirby down to stand with him since this high school is in his district. Mr. Paul Dial, who is retiring as the Chief Administrative Officer, was also recognized for this 20 years of service to the county! Then things start to get a little dicey. Budget adjustments are voted on and passed 5-2. Let that sink in. Voted on and passed! After they are passed, Kirby says he has questions concerning one of the adjustments. M.C. wasn’t sure how to handle this, since Kirby should have asked to pull the item BEFORE they voted to pass it. Billy then screams out, “Let him ask his questions!” M.C. responds that it is the President’s job to determine what to do to which Billy smirks and says that everyone thought she was running the meeting anyway. Bud then smacks the gavel down and calls Billy out of order. And man, it didn’t take long to get back right where we left off did it? Consistency is NOT always a admirable trait! Back to the budget adjustment. Kirby is questioning the purchase of vehicles. Montevue is getting rid of two smaller wheel chair accessible vans and replacing it with one larger wheel chair accessible bus. So, Kirby uses this chance to grandstand about Montevue and how it’s going to drain every last cent out of the county’s coffers. Well, well, well, what’s that Rick Harcum? This money is coming from a self sufficient fund in which the tax payers don’t have to pay anything? Well, Kirby still wants to know what will happen WHEN that fund fails, to which Harcum replies that he doesn’t have an answer to that because he doesn’t see that happening. Kirby then has some questions about some other vehicles, but when he finds out that they all have over 100,000 miles he simply replies, “Okay. That’s fine.” By some further conversation on this subject we are made aware of the fact that these vehicles had already been approved in the 2017 budget. That sounds familiar doesn’t it? Billy votes against approving the minutes (he did this with the agenda as well), nobody wants any new workshop items added so we are off to Billy’s one and only bill. Bud starts off by asking Billy if he has any comments to which Billy replies, ” I moved to approve…”. Billy then asks if anyone has come up with any amendments to his bill. You see folks, Billy thinks that he has so graciously allowed his fellow council members time to modify his bill. In reality, he was trying to get them to do his work for him. This turns out to be a giant trap, however, because since they didn’t add anything it allows Billy the opportunity to tell them all that they don’t care about businesses in Frederick County. Billy also, at least four times, informs us that since NASCAR could open up a racetrack in the General Commercial (GC) district, then this business, that clearly is not allowed to operate in the GC, should be allowed to. How does that logic suit y’all? What’s that Tony? You have put forth your own bill that isn’t as “overreaching” as Billy’s?RUH-ROH! Well, it seems as though Tony actually researched this problem, talked to the Town of New Market and has written a bill that M.C. describes as more of ” a scalpel than a sledgehammer.” Billy is not happy about any of this. When M.C. explains to Billy that it is very irresponsible to introduce legislation that you know will have to be fixed later, and brings up the 17 month process it took to formulate a good solar bill as an example, Billy shouts out that it was ABSURD. Really absurd to take your time to make a good piece of legislation, I mean it’s ludicrous people! Remember this part, gentle readers, for at the end Billy will contradict himself. His solution to the problem of other mulch businesses setting up shop in the GC district is that the County Executive can simply issue a moratorium. No problem! He then lays into Tony. Even though Tony very nicely compliments him, Billy tells him that he doesn’t care about a business in his own district because if he did he would vote for this bill. The solution is right in front of you Tony! Never mind the fact that the planning commission unanimously voted against this AND it would allow any mulching business to set up shop in the GC district. But NASCAR! So, Billy’s hysterics aside it seems as though we can all wait and see what Tony’s bill has to say before making a YUGE mistake by changing what businesses can operate in the GC district. Kirby, who tells Billy that he did a very good job on this bill, is the only one who joins him in voting for this. We feel the need to admonish Billy here. Not only because he did a very bad job in writing this bill or getting anyone else’s input on it, but also because of his attitude. Besides Kirby, no one is going to be willing to work on anything with him because of the insulting, immature way he treats others. In case you were never taught this Billy, study the old adage that you catch more bees with honey than with vinegar. There is a vote to go into closed session to interview people and you can guess who votes no. Kirby and Jerry both have nice things to say. Then it’s Billy’s turn. Remember when we told you earlier to remember that he said that the County Executive could simply issue a moratorium if too many mulching operations set up shop in the GC zone? Well, forget about it! He now wants us to remember when Jan did put a moratorium on solar panel farms and how very horrible and destructive that policy was! Billy once again informs us that the outlook for business is bleak in the county. Contrary to what is actually happening in our county mind you. Jessica and M.C. end things nicely and we have to be back here next week. In September, we will see if Billy can swallow his pride to support Tony’s bill. Shall we start taking bets?